I started making cheese last fall. We were all desperately seeking ideas for crafts to make for our Solstice gifts, and I stumbled on a cheese making kit. For several weeks, I explored the wonderful world of mozzarella. During my obsession phase, I made over a dozen batches, some of which were quite good. Others not so much. 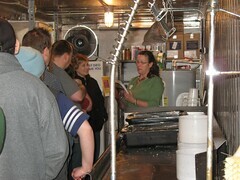 Cheese making is a cross between cooking, alchemy and an exercise in bacterial faith. As with beer, you start with a startlingly short list of ingredients and straightforward, deceptively easy instructions. Then you spend the rest of your life trying to figure out where you screwed up. Unlike beer, even complete disasters can actually still be referred to as cheese. Cheese is a very forgiving food category. So on Saturday, I drove down to central Washington to visit the Blue Rose Dairy and extend my fromage-ilogical skills to chévre. Chévre is apparently French for goat and refers to any cheese made out of goat milk. Oddly for the French, this makes no sense whatsoever. Feta would technically be a chévre, while a jack, Gouda or blue would also be a chévre if you used a goat instead of a cow as your teat of choice. However, chévre in stores appears to also refer specifically to a goat milk cheese with a creamy texture and a slightly sour flavor which you mix with herbs or fruit to make spreads. Think of a cross between cream cheese and sour cream with a grainier texture and then add 10% bonus flavor crystals just for the heck of it. This is what we learned how to make. First, goat milk is not skanky. Bad feta may have made you think that “goat” is a pejorative term for cheese that smells like the inside of an old basketball shoe and tastes worse. Actually, goat milk tastes a lot like cow milk except somehow inexplicably yummier. Second, goats don't smell. This seems impossible, but I stood in a barn full of 100 some odd goats, and it smelled like turned earth and warm milk. The goats were clean, friendly, and basically harmless. I've stood in similarly equipped barns full of cows and debated whether I'd be killed first by the smell or some stupid bovine backing into me and crushing me flat. * Did you know that a goat doe in her prime produces two gallons of milk per day? Holy cripes. * Goat milk is healthier than cow milk. * Like human milk, goat milk changes flavor based on what the goat eats. This explains so much. * Goat meat is yummy. 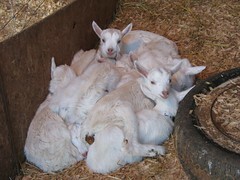 * Goats make really good pack animals and can carry their weight plus about 10 percent. The day was a sterling success, not just because I spent a day without children, a paintbrush, or a tax accountant. The drive was beautiful, the weather glorious, and the creamy chévre we made during class astonishingly good. My favorite taste sensation was smearing it on crackers and drizzling honey over the top. Today, I made my own batch of chévre. Unfortunately, it looks and tastes a lot more like yogurt. Back to the drawing board. Yay for you! I have such love for goats. I keep buying them through Heifer International and Farm Africa. The "Trophy Wife" t-shirt gift is awesome!